Oh my little grandson is too little to eat at this table but a Grandmother can dream of a table full of grandchildren, can't I? 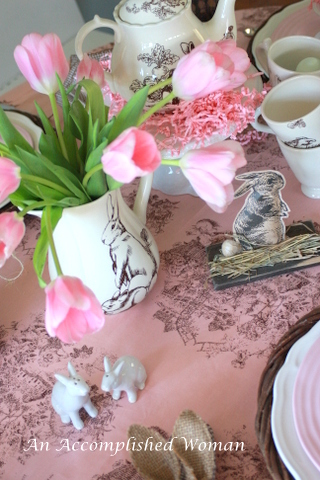 Start with the pink toile tablecloth, believe it or not, I had bought this fabric three or four years ago and whipped up a tablecloth. It has sweet bunnies on it. Pottery Barn wicker chargers with the Ikea chargers. 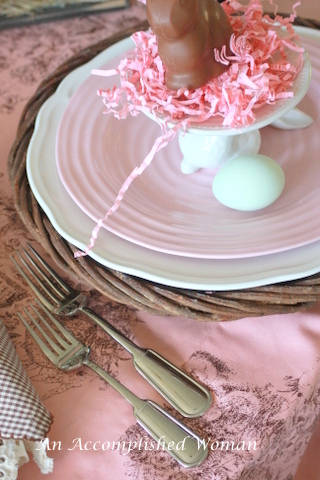 Pink Sophia plates; I know the grandson would prefer blue but hey, it is my day dream. 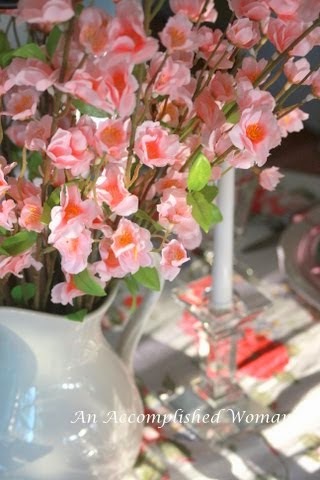 I love the softness of the pink color. 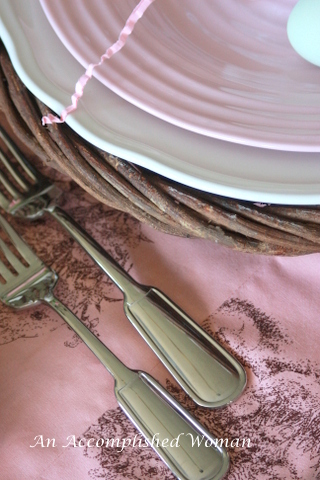 The Ralph Lauren flatware, simple but elegant. 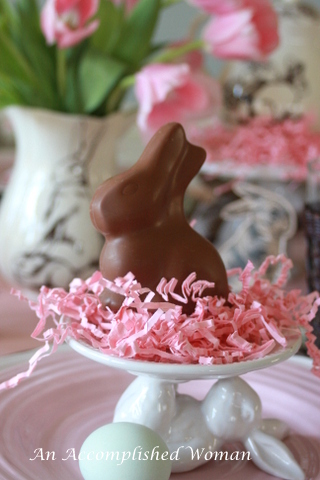 Pottery Barn cupcake stands... topped with a cute chocolate bunny. 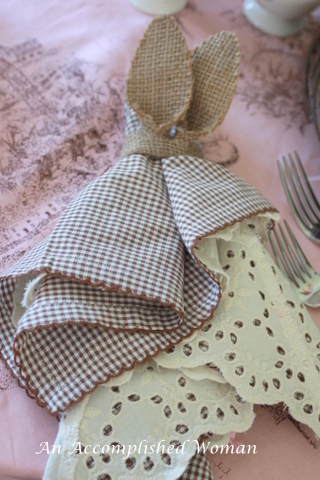 Brown and white checked napkins from Pier One, on clearance. 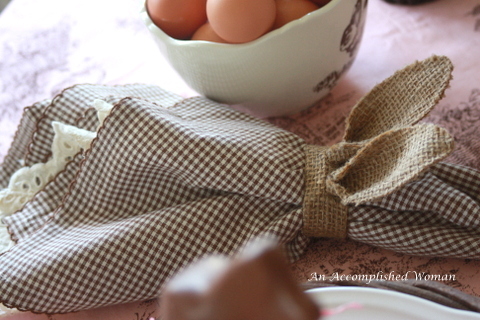 Oh and the cutest burlap bunny napkin rings. 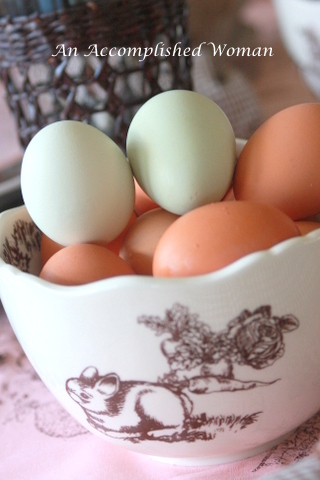 Bowls filled with eggs. I filled them with natural eggs that I had boiled. 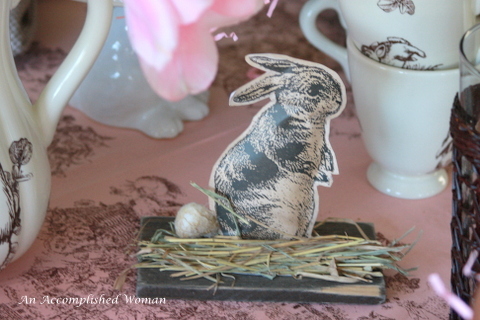 This little bunny.... he looks like the toile bunny come to sit with the children. 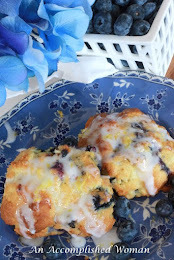 I am joining Susan at Between Naps on the Porch, Cuisine Kathleen , and the Style Sisters. I hope you enjoy the grandchildrens' table. Some day they will come to eat Easter and I will be ready!!! What a fantastic table for the grandchildren! 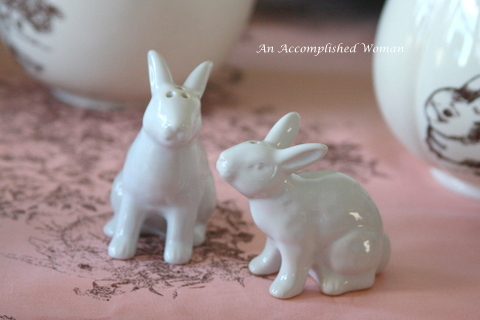 Oh, the cutie bunnies everywhere! 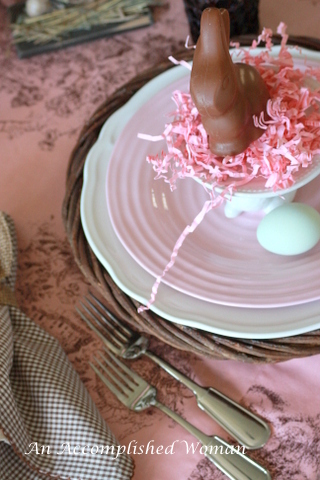 I so enjoyed this, but my favorite thing on your blog today is the photo of the little one with the egg in your header - so, so sweet. Hope you all have a wonderful Easter - I think you will!! Lovely tables cape....beautiful in pink!! Sweet, sweet table. Love all the pink! 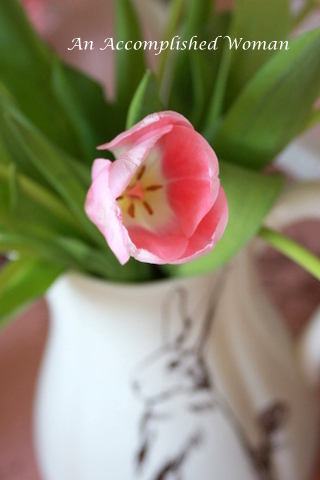 I especially like the pink plates and tulips in the pitcher. So many perfect touches. Thanks for sharing. 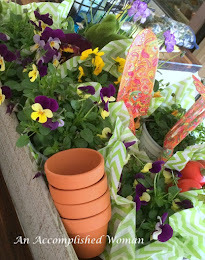 I do have grands that sit at their very own Easter table and you have given me some great ideas. 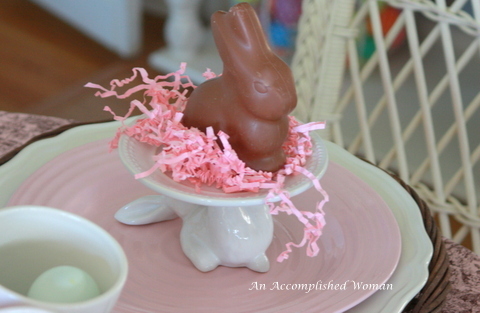 Love the chocolate bunny on a pedestal and the pitchers with tulips. 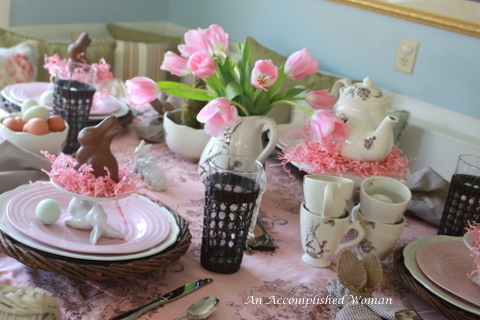 I will be setting their Easter table up Sun morning only because it is on a screened porch that opens up with French doors from my dining room. The kidlets feel like they are a part of the grown up table because they are so close. We do have two that are very young and cannot sit at the grand children table but soon. HAPPY EASTER. I enjoyed the entire table! OH, good grief! This is...this is...this is gorgeous! I LOVE the tablecloth! 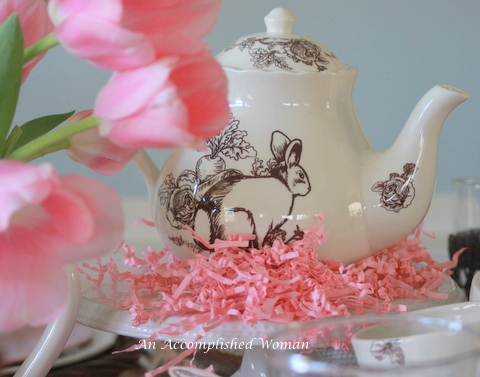 LOVE the bunny teapot, cups, pitcher and bowl! LOVE the dishes. (Yes...go ahead and dream in shades of pink, Grandma!) I love that this is in brown and pink and white!!! I just love this!!!!!!!!!!!!!!!!!!! Found thru you thru NOTP party. 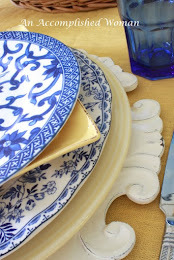 Love everything about your little table! 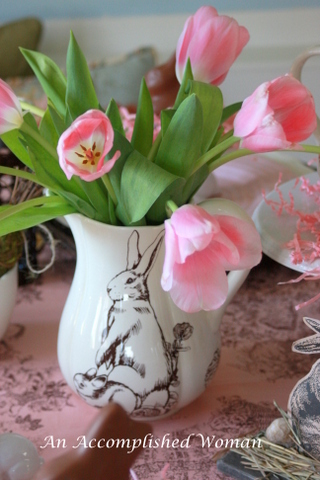 The bunny dishes are adorable and the pink tulips, lovely in the teapot! I hope I can do something half as sweet for my little granddaughter when she is big enough! 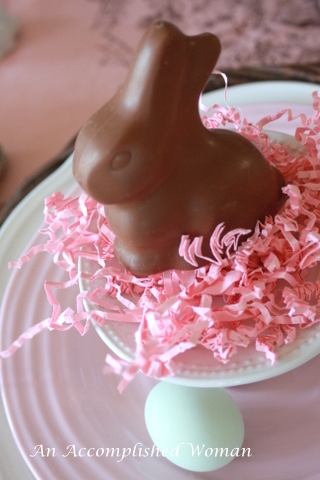 May you have a delightful and wonderful Easter! 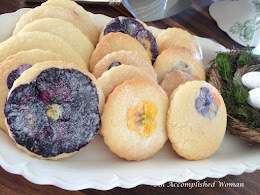 Your post is beautiful and full of life. What a darling table. I'm sure he'll be gathered round in no time. I'd love to have you link to Seasonal Sundays. The link goes up on Saturday at 7 pm. 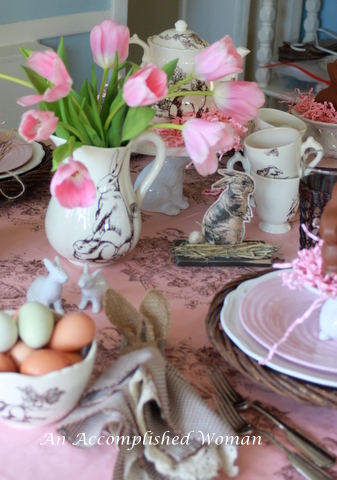 This is a beautiful Easter table!! 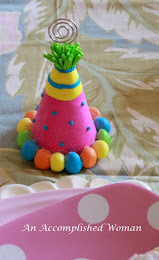 I love pink and brown combinations and you have done it exquisitely! Have a wonderful Easter celebration.